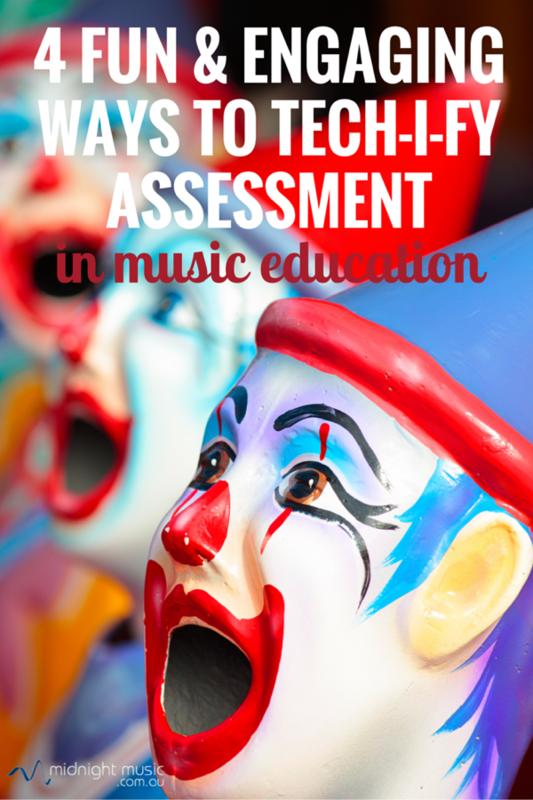 All music teachers need to gauge student learning at some time or another. You may test at the beginning of a school year to determine the level of knowledge of a new group of students, or halfway through a class to find out whether students are on track with the lesson. At the end of a lesson you might run a quiz to find out whether students grasped the main aims of the lesson or you may quiz them at the end of an entire unit of work to test overall learning. 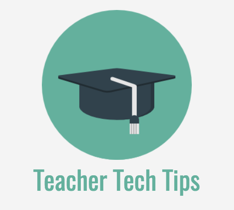 Using the tech tools below you can set up your own customised quizzes and tests. 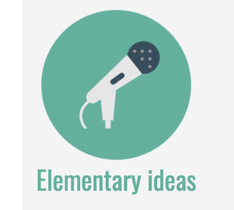 Yes – there IS an investment of time required to set them up but as mentioned above, you can reuse and repurpose quiz materials so in the long run the investment pays off – I promise! Kahoot is a game-style quiz tool that gives points for correct answers AND for speed (if you choose to assign points in your quiz). LOTS of fun and very engaging. Go to Get Kahoot to set up your account and create quizzes. All students need a device to answer quiz questions in Kahoot, but ANY device can be used. 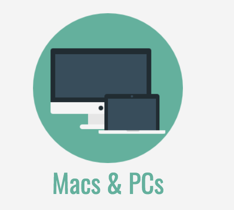 That includes, laptops, desktops (Mac and Windows), iPads, Android devices and other smartphones. 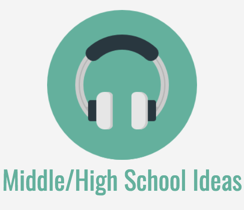 If you have limited devices, split students into teams instead and have them take turns answering the questions. My top tip is to search, search, search! Look for existing quizzes first before creating one from scratch. There might be one that has already been created by another teacher that you can use. When you find one, make sure you click the Favourite button so you can find it easily later on. If the quiz has a couple of questions you don’t want to include (or you’d like to change), duplicate it and adjust the questions (delete or edit them) to suit your own purposes. 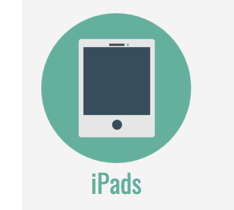 Tech required: All students need a device to answer questions, but it can be ANY type of device (Mac or PC laptop, Smartphone, iPad etc). Internet connection also required. Top tip: ask students to create quizzes for each other to demonstrate their understanding of a topic. Plickers are “paper clickers” and allow the teacher to capture student answers super-fast. Very little technology is required – in fact, only the teacher needs to have a laptop and device (of any flavour). Students answer multiple choice questions by holding up printed paper cards that look a little like QR codes. Each of the four sides of the printed “code” has a letter (A, B, C, D) and students hold up the card so that the letter for their chosen answer is at the top. The letters are small to ensure anonymity when answering. Plickers work well for young students who can’t easily read text-based questions on a screen. The teacher can say the question out loud and then students simply need to hold up their card to indicate the answer. Plickers quizzes can’t be shared (yet) unfortunately. I’m hoping that feature will be added sometime in the near future. Here are some images from a Peter and the Wolf instruments quiz that I created. 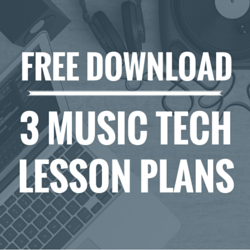 Tech required: Only the teacher needs a laptop and device (iPad or Smartphone). 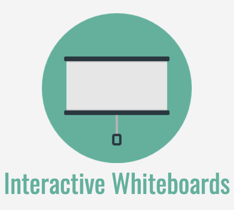 Socrarive is a versatile tool that allows you to run interactive assessments with students. Their Quiz format – in which you can set up a quiz ahead of time – includes options for multiple choice questions and longer-form answers. 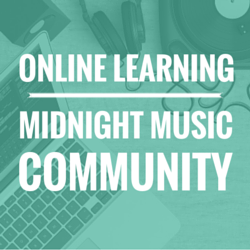 Create and save quizzes in your account so you can use them at any time, with any class. You can share quizzes with colleagues and other teachers around the world. There is also a “quick question” mode that allows you to poll students on-the-fly, during class time itself. No preparation is required on your part o it’s great for instant, on-the-spot response from students. You can choose true/false, multi choice or short answer formats. Simply type in question during the lesson and gather real-time responses from students. 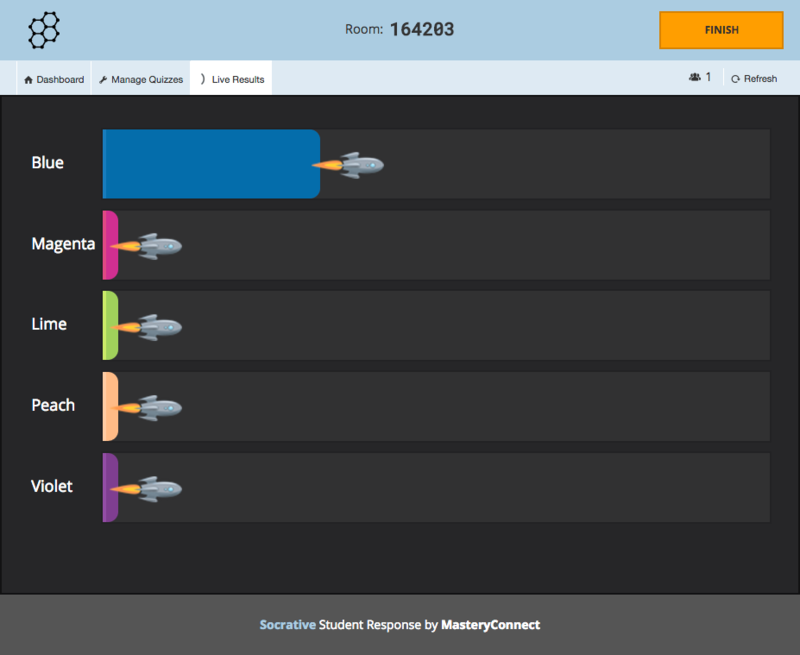 In addition to the first two formats, Socrative has a “Space Race” – use this format to run your quiz as a fun and friendly race which can be played individually or in teams – and an Exit Ticket for speedy formative assessment at the conclusion of a lesson. 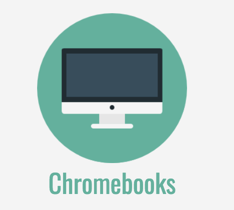 Tech required: All students need a device to answer questions but they can use ANY type of device (Mac or PC laptop, Chromebook, Smartphone, iPad etc). It’s important to note that they don’t necessarily need to all take the quiz at the same time, so if you have a small number of laptops or iPads in your classroom, you could rotate students through the quiz activity. Internet connection also required. There is so much awesome video content available on the internet these days and resources like Playposit (formerly Educanon) allow teachers to make video-watching more meaningful for students by embedding questions right inside the video itself. Once you’ve logged into Playposit you can select a video from Youtube or Vimeo to embed and then go ahead and add multiple-choice questions, or longer form questions to the video. When the students watch the video, the video will pause when it reaches one of your questions and students can select from multiple choice answers, or type in a longer form answer. Because students answer independently and in their own time this makes an ideal activity for a substitute teacher, or as a “center” (rotation) activity. If you only have a single computer and a data projector, the class could take the quiz as a group. Using Playposit works really well for critical listening activities. 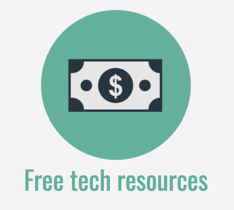 Tech required: All students need a device to answer questions but they can use ANY type of device (Mac or PC laptop, Chromebook, Smartphone, iPad etc). It’s important to note that they don’t necessarily need to all take the quiz at the same time, so if you have a small number of laptops or iPads in your classroom, you could rotate students through the quiz activity. An internet connection is required. You could also run the quiz as a group activity if you only have a single computer with a data projector. Tip: use the Reflective Pause option to warn students about what they need to listen for the in section that is about to follow (ie. “Listen to the next section. Which instrument is playing the main theme?”). Then use Add question feature at the end of the section so that the students can provide their answer. Would you like a copy of this blog post? Click on the button below to download a copy. It will be sent straight to your email inbox. 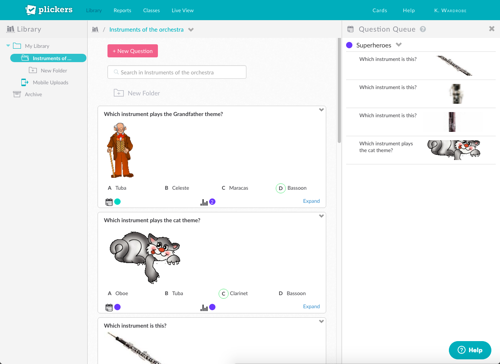 Katie, can quizzes used in Playposit be made from multiple video sources for use as a Post Test where we need to cover questions from a wide variety of concepts/topics? Would I need to find a way to merge all my video into one and then enter my questions? Does the App score each students’ responses/answers and provide results in any way? Thanks for your reply – if possible. Hi Bob – yes, the videos would need to be all merged into one. You’d then need to upload it somewhere like Youtube or Vimeo in order to use it in Playposit. And yes, the student responses are tracked if you set the students up in a class and assign the video quiz to them. From memory, I think you can export the results as a CSV file if you need to as well.